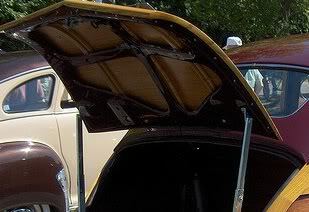 Membership to the Town & Country Chapter of the National Woodie Club (NWC) requires that you are a member of the NWC. Membership to the Chapter is $20.00 (Jan. through Dec.). This annual fee is used for direct operating expenses such as building and maintaining the Chapters website. It will also be used for expenses directly associated with preserving the history of the Town and Country. The Chapters officers do not receive any compensation for their time. Our T&C Chapter of the NWC has filed with the U.S. Internal Revenue Service (IRS) as a Not For Profit Organization (tax free). By way of introduction, I am Robert C. Leher, your fearless president (retired), doing my best to lead us into the new age of cyberspace. Before I took up the cause of getting us all together for this journey, I was a lawyer (yes, a lawyer) for some twenty-seven years. My wonderful wife Carole and I have the privilege of enjoying our second T&C, a 1948 St. Clair blue convertible. It took me almost seven years to restore this car from nearly junk yard status. I used to tell people about my long term project, thinking that there was some sort of status in hanging in there for so long until the finish. But often the response from the person hearing my story was that “Well, my restoration took eight, nine, or ten years (or even more). Carole and I are now lucky enough to be living in Naples, Florida in the winter and Denver, Colorado in the summer. Our son, Cooper, is getting his Masters degree at the University of Oregon. I would like to thank our two other officers, Harold Mermel (current President) and Terry Neeley (former Executive Vice President), who have been working ceaselessly for the last six months to get our Chapter off the ground. 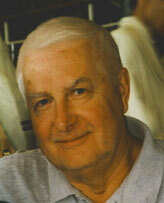 Harold’s input and constant work in encouraging new members has been invaluable. Terry has been the heart and soul of the interim website. Special thanks also go out to Bob Porter, whose encouragement and advice has helped to make this all happen. I also want to thank Jerry Witt, Mike Grajcar and the members of the Board of the National Woodie Club who have welcomed us aboard. Here is the important thing. I repeat, here is the important thing. Our Chapter and the new Website will be as successful as the information that goes into them. Each of you is involved with the hobby in different ways. Take a moment and send us an email about what you are doing, and we will get it on the website and share it with our membership. Are you working on a project? Take some photos (including a picture of you) and send them to us. Let us know what your special project is about, and we will put it online. Are you going to a local, regional, or national show? Email us the pictures, and tell us about it (even if it is just a paragraph or two) and you can become a star on our website. We need technical information, history, and where to find parts. Looking to buy or sell a car? Let us know. We will circulate the info. I think you get the idea. We need everyone to participate actively in the Chapter. I recognize we are in our infancy in a hobby of not so infant cars, and we need you to jump in and share whatever you are doing. This will make it happen. 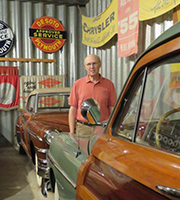 I started collecting old cars in 1965 with a 1942 Dodge sedan, which I still have. I collect mostly Mopars, but have others too. Currently, I have 18 old cars of which 10 are woodies (4 are T&C cars). I currently have a 1942 T&C barrelback (have owned 3 barrelbacks) and am knowledgeable about them. I have owned every T&C model from 1941 to 1950. I also own a 1949 Chrysler Royal woodie wagon and two Plymouth woodies. I have lots of T&C literature and photos. J.S. “Jeff” Larger was the T&C Gathering 2015 Committee Chair. A record five pre-war Chrysler T&C’s were in attendance along with another five post war T&C’s. 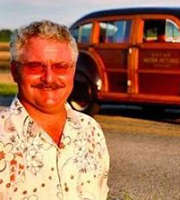 In 1966 Jeff’s father Richard purchased his first collector car, a 1942 Chrysler T&C Windsor Sedan (wagon). The now known Escar “black-out” car was literally rescued from the riots burning of Cleveland’s old industrial areas. The car was our weekend home at many Cleveland area car shows during the late 1960’s. Our ’42 was stored from the late ’70s until 2004 when brothers Jeff and Gary Larger performed minor preservation work retaining much of the cars originality. It still has just 24k on the odometer and wears much of its factory built livery. During high school Jeff worked for Yenko Chevrolet, first, as a lot boy then body shop apprentice. After a stint @ OSU, Jeff’s fleet and lease career began with Chesrown Oldsmobile-GMC, just in time to participate in the great Cutlass sales records, which rocketed Oldsmobile Division to #3 and over 1-million in annual sales for many years in a row. Jeff and his Mentors took the dealership into the top ten in volume out of 3,300. Dealers nationally for Oldsmobile Division of General Motors. In 1993 Jeff co-founded Nationwide Fleet Services / Quality Auto Lease (NFSQAL), which became one of Central Ohio’s leading fleet and lease “independent” auto dealers. NFSQAL was the sales and leasing provider for AAA-Ohio as well as a number of large Federal Credit Unions. The early 2000s’ saw Jeff as co-owner of another used car and then Suzuki new car dealerships. 2004 Route 36 MotorCars was formed and continues to this today. Jeff and wife Karen reside in Powell, Ohio. They are parents of three grown children and two grandchildren. I’ve been into MoPar products for some time—since I got married to my wife, Andree, back in 1968. She is the daughter of a Chrysler-Plymouth dealership parts manager. 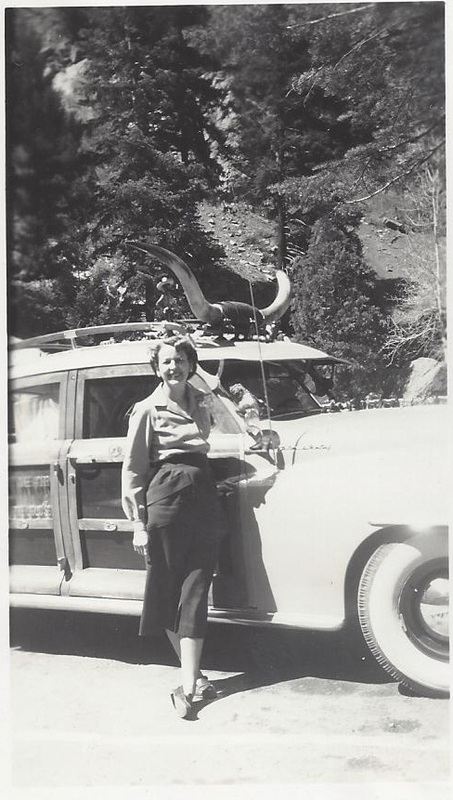 I had an interest in old cars and with her support I picked up a ‘39 Plymouth touring sedan when we moved to Akron Ohio soon after our marriage. In fall of 1971 while living in Lancaster Ohio we had to take a detour through Newark Ohio and saw our first woodie, a ‘50 Chrysler Royal wagon, for sale on the front row of a used car dealer early in the morning. The next day we owned it. Shortly after restoring it in 1974 we moved back to Nebraska (I’m from Nebraska City—the home of Arbor Day so must have an inborn love for wood?). While in Ohio I heard about a NOS ‘49 T&C which remained for sale at a dealership in central Nebraska and started stopping to see it and other NOS MoPars in the showroom at least yearly when going to Colorado and after a few years started making offers on it. In 1983 we got together on a mutually agreeable unreasonable price and we ended up with our names on the previously unissued Manufacturers Certificate of Origin and took the car home. It’s been with us ever since—just occurred to me that it was a 34-year-old car then and effectively another 34 years have now passed!! Time flies! 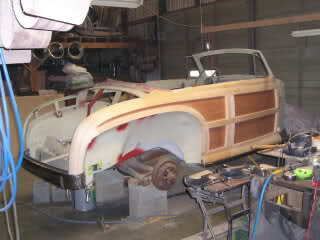 It is the woodie in the rear right corner of the photo which also shows our ‘50 wagon and one of our ‘50 hardtops. We now have a total of two ‘49 T&C converts, the ‘50 wagon and two ‘50 hardtops. We have previously let one ‘49 and one ‘50 go to new homes. Have around 20 collectible Mopars currently. I have been collecting MoPar memorabilia, parts, and literature for years-even loaned some to Don Narus when he did his original woodie book. I remember joining the TCOR in the early years and feeling that the ‘50 wagon didn’t belong but have always been proud that we joined the group. I look forward to working with others to help the T&C chapter. I was one of the founding members of our local NWC region and served as president for eight enjoyable years. I am also currently president of the local WPC club region. In 1947 as a Sophomore in High School, I was so impressed with our neighbors new Chrysler, that I vowed to one day own one just like it. During my High School Junior and Senior, I worked as a “Lot Boy” at a local Chrysler dealer.washed cars and got to drive them around the lot. I will never forget the 1948 T&C Convertible the day it arrived at the dealership. I washed it and drove it. I was so impressed that the image was etched in my mind. 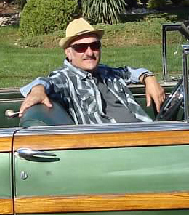 In 1970, married with two children, I purchased a 1948 Chrysler New Yorker Sedan with Highlander Plaid. It would become the first of many. In 1971, I acquired a 1948 T&C convertible (exactly like the one I drove as a “Lot Boy”). This led to two 1947 T&Cs, two more 1948 T&Cs and a 1949 T&C, which also led to my first book, “Chrysler’s Wonderful Woodie”, and the founding of “The Town and Country Owners Registry”, and many more books. Soooo as they say: “The rest is history”. That’s pretty much my story. 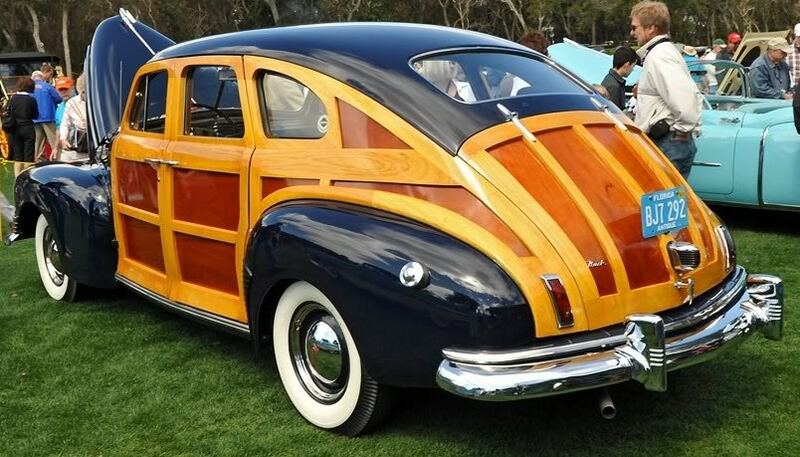 Chrysler or Nash, who built a better “Woodie” Sedan? Like Chrysler, Ford and the rest of the auto industry, Nash offered nothing new for their post World War II model line up. Everyone was selling warmed over 1942 models. But it was a sellers market so it didn’t matter. The trick was to get more potential customers into the dealers showroom. 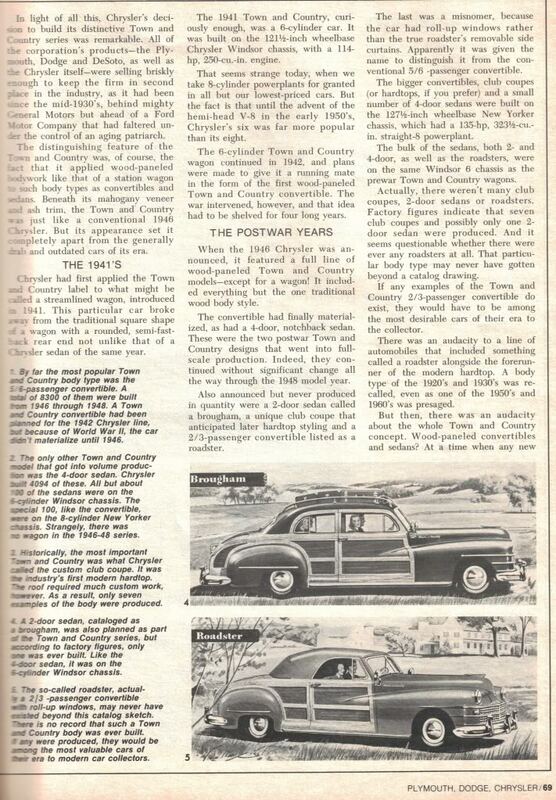 To this end Chrysler was offering the Town and Country, a per-war success that was entirely new for 1946. Ford was offering the Sportsman, an all new model for 1946. Nash had limited resources and no time to develop an all new model. But a “Woodie”, now that might be doable. The Nash Suburban debuted in 1946, it was built on the Ambassador Slipstream 4 door sedan. All the wood components were made by Ionia Manufacturing, of Ionia, Michigan and assembled by Seamon Body Company, Milwaukee, Wisconsin. The thin White Ash framing and Mahogany insert panels were applied over a skinned steel body. 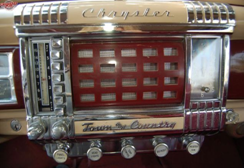 It looked a lot like the 1941-1942 Chrysler T&C Station Sedan and I’m sure it irritated the folks over at Chrysler. 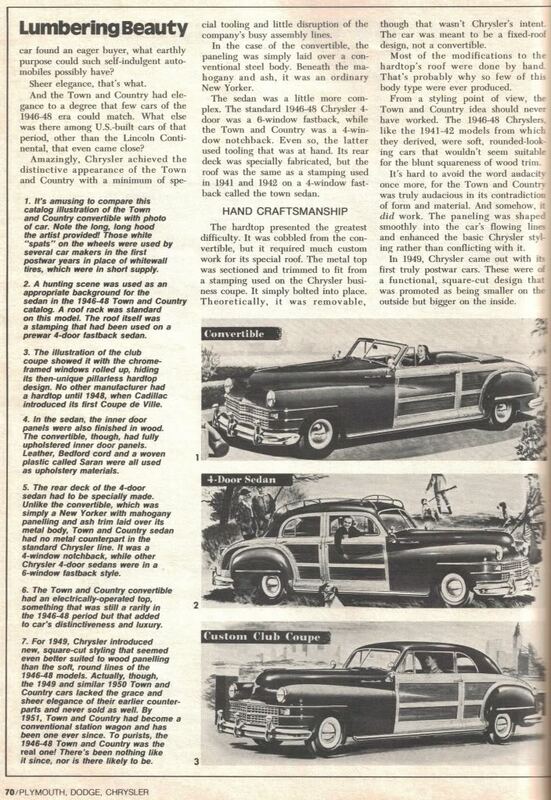 The suburban was offered from 1946 through 1948 , only a total of 1,000 were built for the three model years. The Suburban was priced at $1,929. in 1946, compared to the Town & Country sedan which was priced at $2,366. 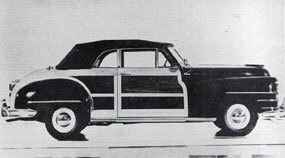 Nash produced 275 for 1946 while Chrysler built only 126 (primarily due to a late start, material shortages and strikes). 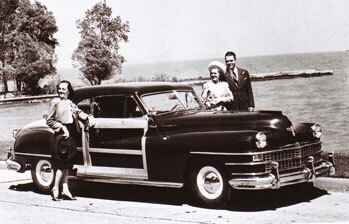 Chrysler continued to build the Town and Country sedan with all the wood components being structural. This type of construction required more time and considerable craftsmanship. Not to mention a lot more wood. The result being only two production cars (sedan and convertible) instead of the five that were originally planned. 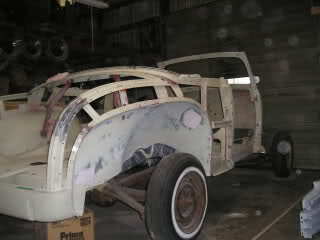 Nash on the other hand used the same method as Ford, a skinned steel sedan with wood fastened to metal. It was cheaper and faster. So the question is, who built the better woodie sedan? Chrysler or Nash? In retrospect, maybe Chrysler should have used the wood over steel method, this way they may have been built all five of the proposed T&C models. But then it probably would have defeated the original purpose. 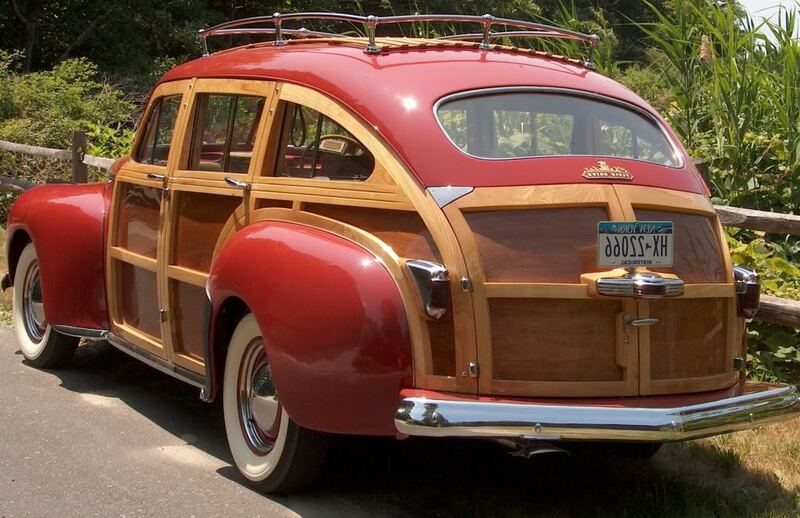 Chrysler, like Ford and Nash used their respective, unique woodies as traffic builders. It drew potential customers into the showroom. Selling the woodies was a bonus. The 1941-42 Chrysler T&C (left) and the 1946-48 Nash Suburban were similar in design. Both followed the lines of the steel bodied sedans which made them unique. 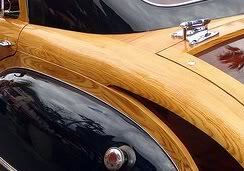 The rich White Ash grain pattern is evident in both cars. Chrysler (left), Nash (right). 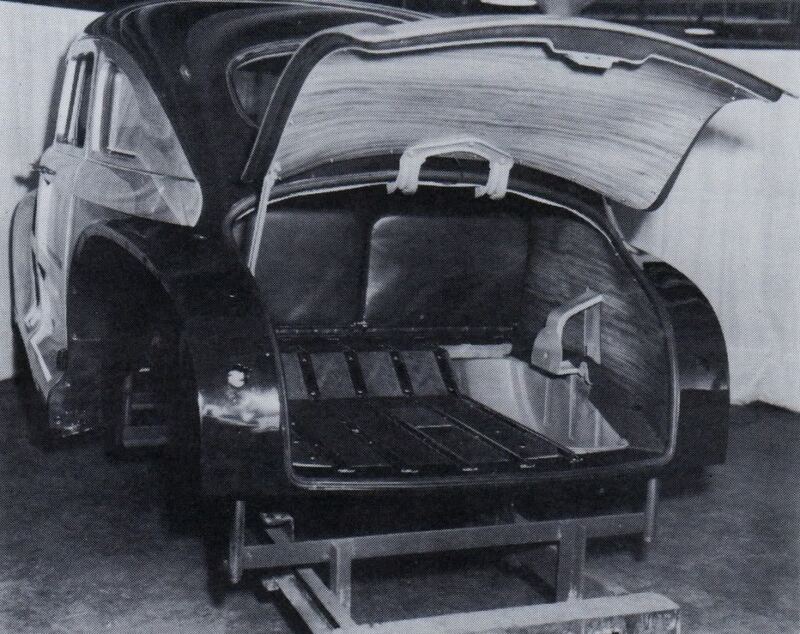 (Left), Chrysler did consider the wood on steel construction method in 1946 and actually built a prototype DeSoto sedan. But ultimately it was scrubbed. 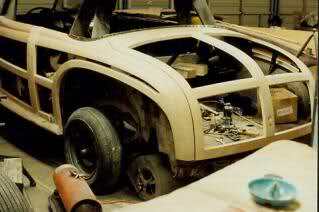 (Right) The Suburban wood components are fastened to the metal framework of the deck lid. 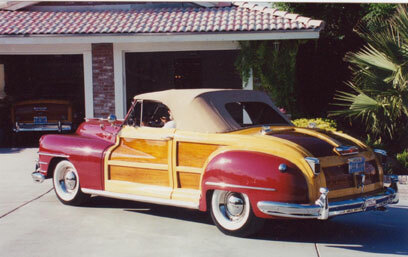 Chrysler or Ford, who built a better “Woodie” convertible? 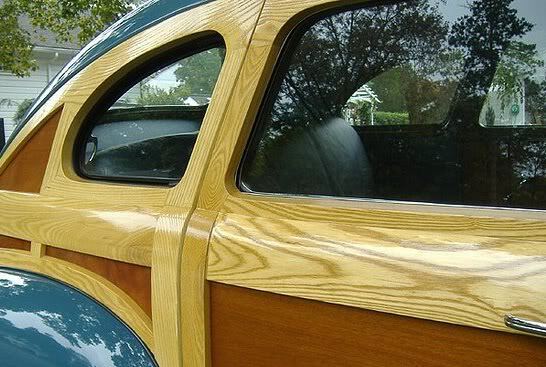 Chrysler and Ford were the only auto manufacturers to built wood bodied cars in house during the 40’s. Chrysler had Pekin Wood, in Helena, Arkansas and Ford had Iron Mountain, in Michigan’s upper peninsula. However, Ford had more experience building station wagons. 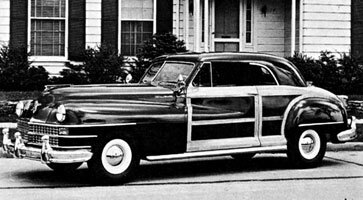 Chrysler had Pekin Wood build the component pieces of the Town & Country, than assembled them at their Jefferson plant in Detroit. While Ford built the entire Ford Sportsman body at Iron Mountain. And shipped the finished body to various assembly plants around the country for final assembly. 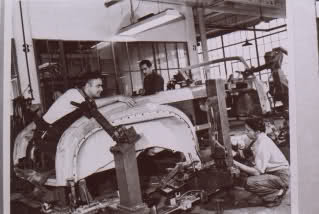 Each company had their own method of manufacture. The Chrysler process was a bit more complicated then Ford’s. 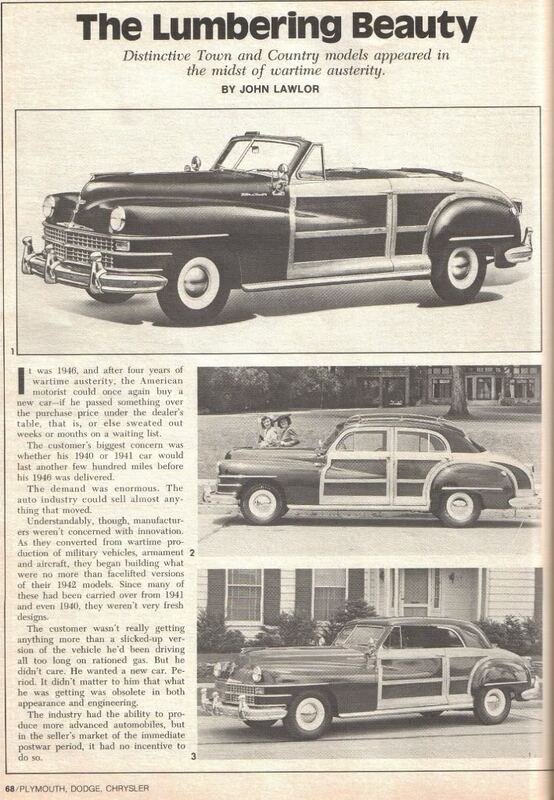 We all know that the wood on a Town & Country is structural. It took more wood and more time to build a Town & Country. Ford on the other hand built their Sportsman using a steel skeleton, to which they attached a wood skin. It took less wood and less time to build the Sportsman. Who’s wood was better? Was the White Ash used by Chrysler better than the Maple and Birch used by Ford? Both were hardwood with different grain patterns. The ash has a bold, open grain pattern that really stands out when varnished. The Maple or Birch has a closed, tighter grain pattern. The Chrysler I believe weathered somewhat better than Ford. This was probably attributed to the density and shear size of the wood used by Chrysler. Because the wood was structural the pieces used were thicker. Ford used the wood as a skin, it was thinner. Once weathered it did not take long before rotting through. During the three year production run, 1946-1948, Ford built 3,692 Sportsman. 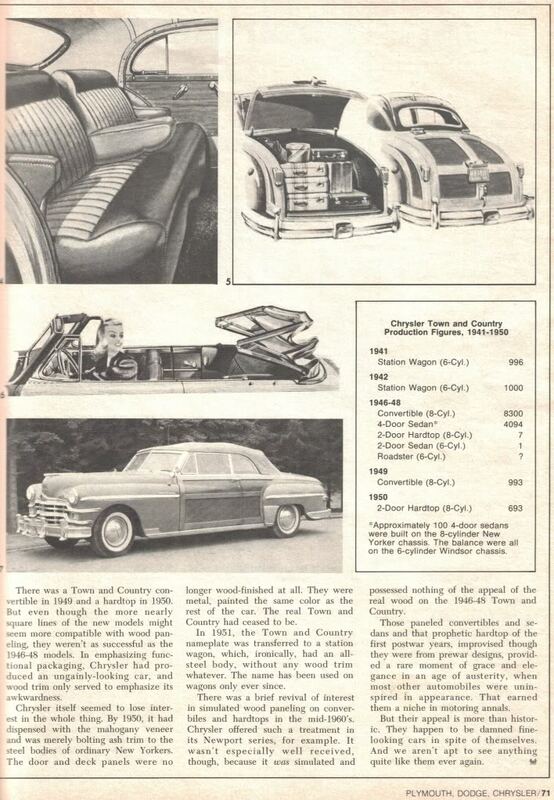 During that same period Chrysler built 8,375 Town & Country Convertibles. It is estimated that around 100 Sportsman survive*. A survival rate of 2%. There 382 documented surviving T&C Convertibles. A survival rate of 4.6%. Ironically Chrysler adopted the steel skeleton building method in 1949. Ford used a steel skeleton and thinner Maple and Birch wood pieces (a wood skin). Production methods are compared. Ford on the left, Chrysler on the right. 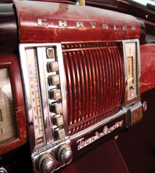 In 1940 Chrysler used dash plastic conservatively but continued the “Art Deco” look. Chrysler offered a choice of ten colors in 1941 and introduced Mottled (Marbleized) plastic for a more luxurious look. Right, one set of plastic trim pieces for 1941 Sedan. 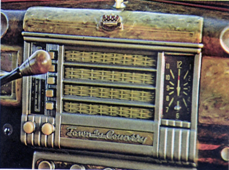 The radio grille changed from (1941 left, 1942 center, 1946-48 right) vertical ribs to horizontal bars (with basket weave) to an egg crate design. More die-cast in 1946-48. Although six were produced I have always considered the hardtop a prototype because it never went into production. So the question is: why only six? This would have been an easy build. 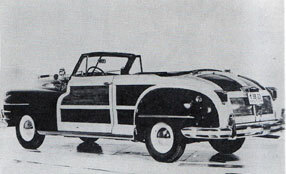 A convertible body with a coupe roof panel. So why only six? Only one Brougham was built so there is no argument about it being a prototype. What happened to it remains a mystery. Fortunately dedicated Town & Country collector Lloyd Mayes took it upon himself to successfully reproduce the Brougham. His finished car is very impressive. Although his interior is a personal preference and not what the factory did. The Roadster was considered a whim. It looked interesting as an illustration in a brochure but totally impractical as a production car. The idea was quickly discarded as the reality of production complexity became apparent. Not to be deterred Town and Country collectors John Slusar and Lloyd Mayes ultimately collaborated to build this unique T&C. John Slusar did the research and started the build only to be frustrated and discouraged after several years of effort. In the end the project was turned over to Lloyd Mayes who finished the project. The finished car is a testimonial to John Slusars vision and tenacity, and Llyod Mayes’ resources and commitment. Another prototype not to well known was the C-38 Convertible. One was built, its ultimate disposal is a mystery. There are several factory photos of the car but no archival information as to what became of the car. Chrysler’s practice at the time was to eventually sell its prototypes and one-offs. So its safe to assume that this car was sold to someone. But again there is no official record. Which gives rise to another theory. It’s possible that the body was re-mounted on to a C-39 chassis. Now for the lingering question. I wonder why no collector has reproduced this car. It would be a somewhat easy project: take a T&C body and mount it on a C-38 chassis, add a Windsor front clip. Done! If I were 30 years younger and had the resources, I’d do it. And last but not least, one more one-off, prototype of sorts, but not officially factory made. It’s the movie 1942 T&C convertible, which I will cover in my next installment. As Club Historian I would like to write about and discuss cars with interesting histories. I know many of you have such cars, with interesting histories. I would like to hear from you. All I need is some basic information: How you got the car? How long were you looking? Do you know anything about its past history? Did you restore it? How long did it take? And a couple of photos. You acn Email you information to me at: DLNARUS@yahoo.com OR Mail to: Don Narus, 2325 Pine Ridge Way S. B-1, Palm Harbor, Florida 34684. Has anyone spotted this T&C woodie sedan car lately?